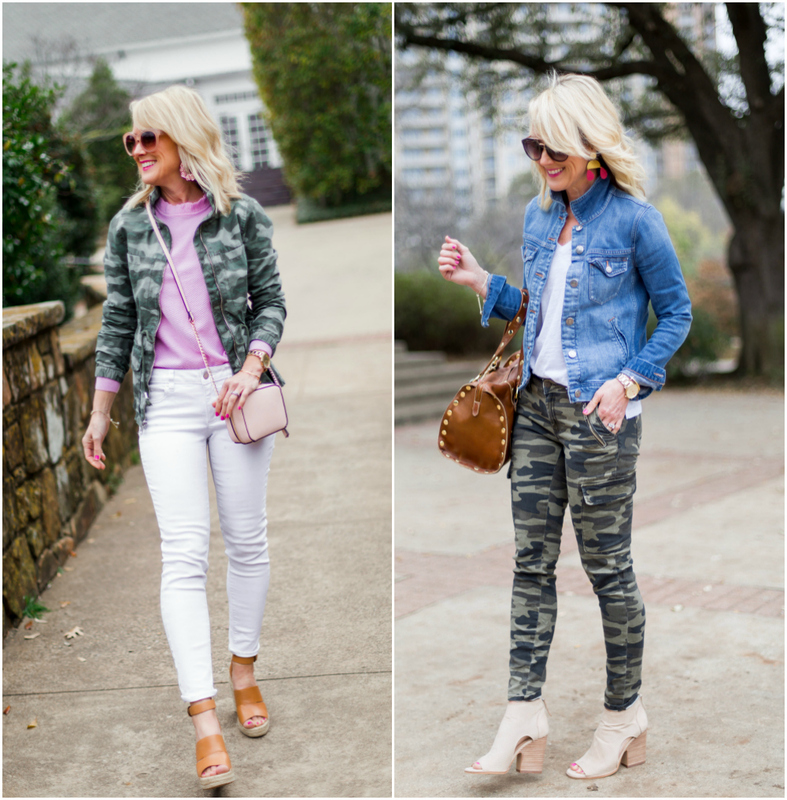 Camo Love | Two Ways for Spring | hi Sugarplum! Happy Monday, loves! How was your weekend? We had a full day of travel yesterday, and we didn’t even leave the state of Texas! We’re spending Spring Break exploring the wide open spaces of West Texas…Marathon, Marfa, Bend Bend National Park and more. I can’t believe I’m a native Texan and have never visited this spectacular area of the country. I’ll share our experience in a series of Trip Reports here, but you can follow along on Instagram or Facebook this week, too. 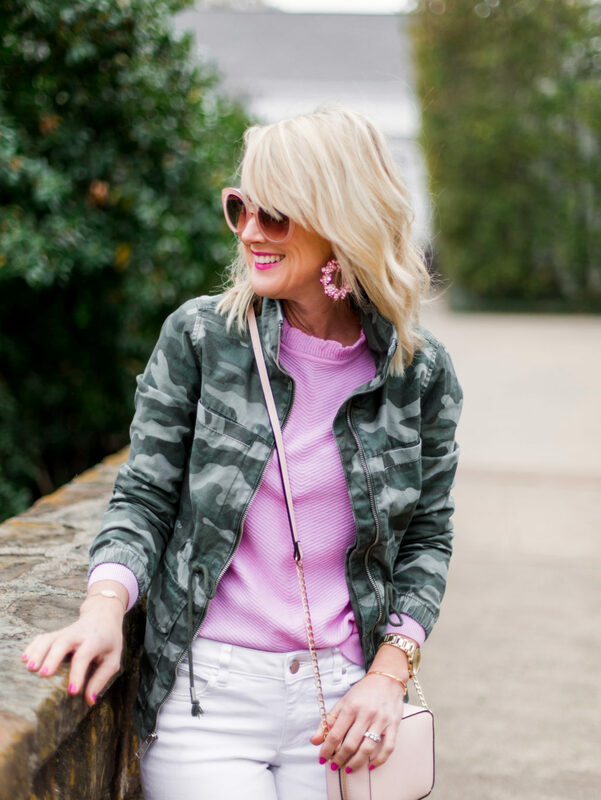 My obsession with camo is still running strong, so today I’m styling it two ways for Spring (see it two ways for Fall here), starting with the biggest-bang-for your buck utility jacket! 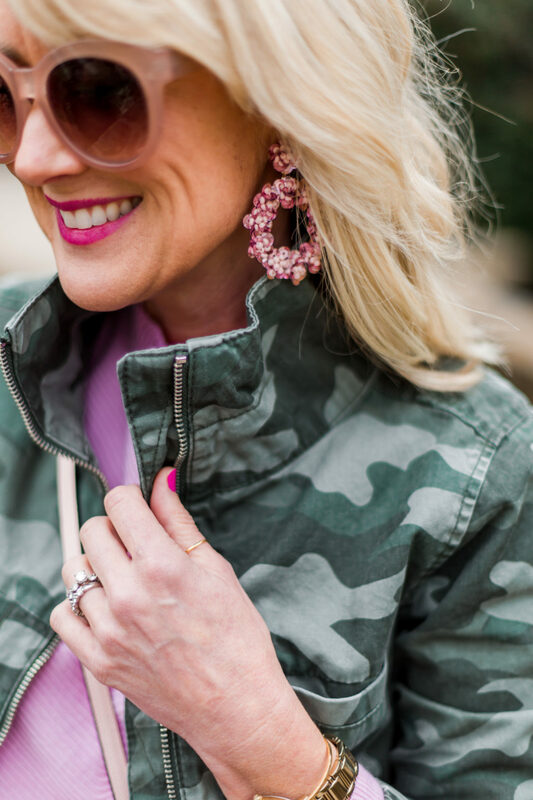 I consider camo almost as neutral as leopard, and pair it with most every color, but am partial to wearing it with pink. I also like it with white, navy, chambray, gray, and red. 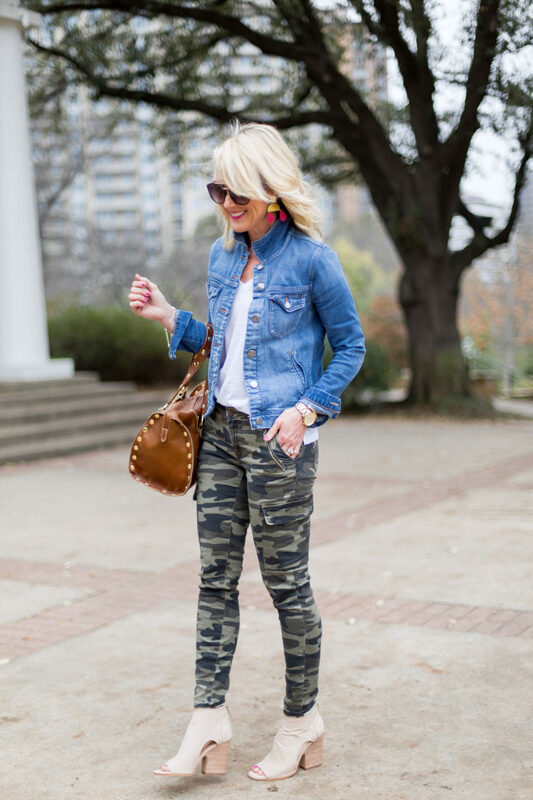 As for pattern-mixing with camo, I choose something with a small scale or print, like stripes or polka dots. 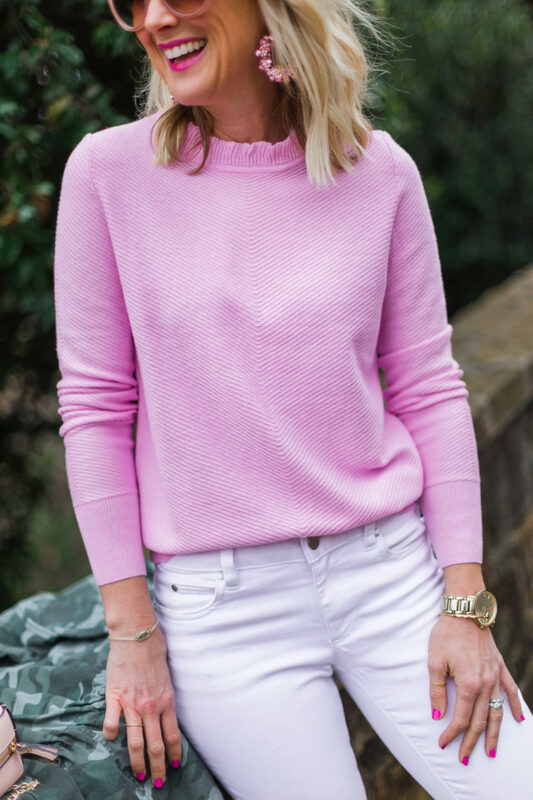 This pullover is solid, but the texture and ruffle collar act as a pattern, adding more interest to the combination. I love the juxtaposition of the rugged jacket with blingy sequin earrings, too. 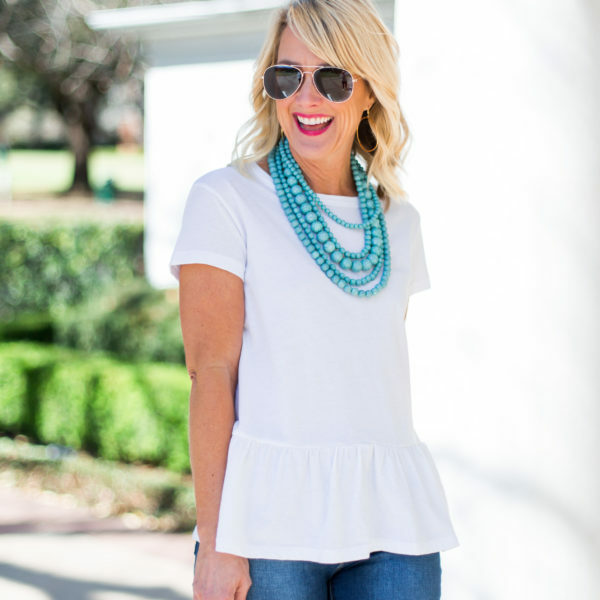 Pairing the whole thing with white jeans makes it fresh for Spring. 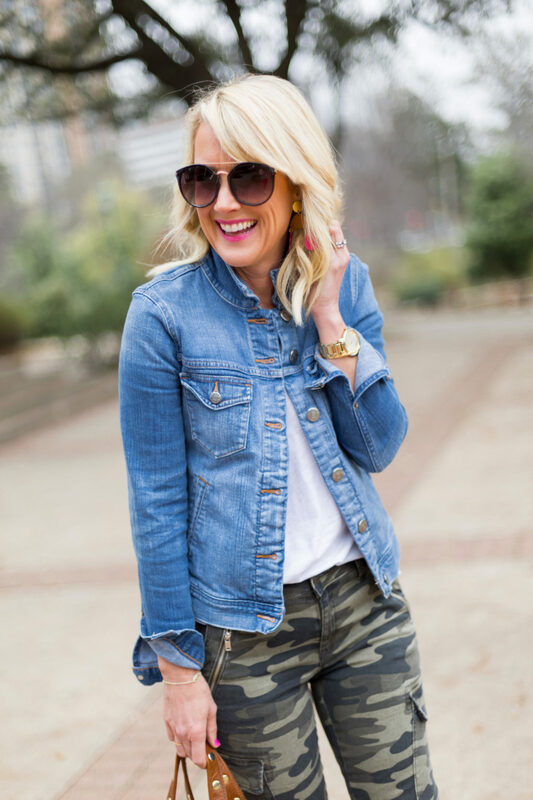 Fit Tip: This jacket is sturdy and surprisingly well-made, especially given the price! The collar stands up, or folds down, and the drawstring creates a flattering, feminine silhouette. I have it in three color, so obviously I’m a fan! I’m wearing an XS. I’ve been talking about these wedges pretty much non-stop since finding them last month, and am thrilled to finally be able to wear them! The leather is soft, and the wedge gives great height without sacrificing comfort. 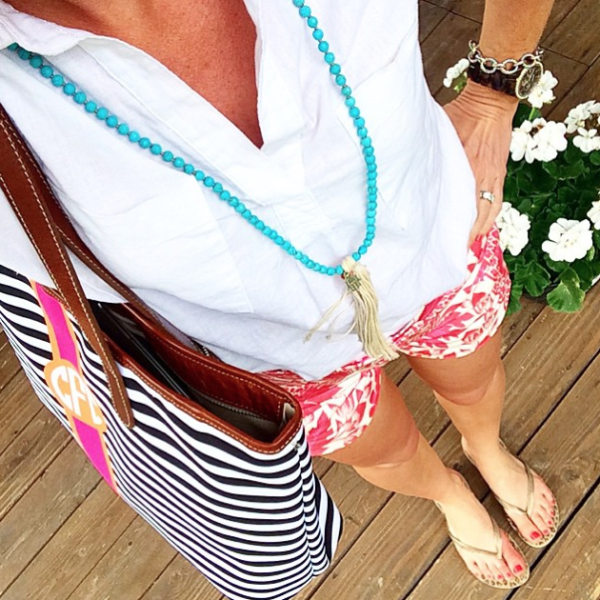 Fit Tip: I’m wearing my usual size, but would probably size up if you fluctuate between sizes. 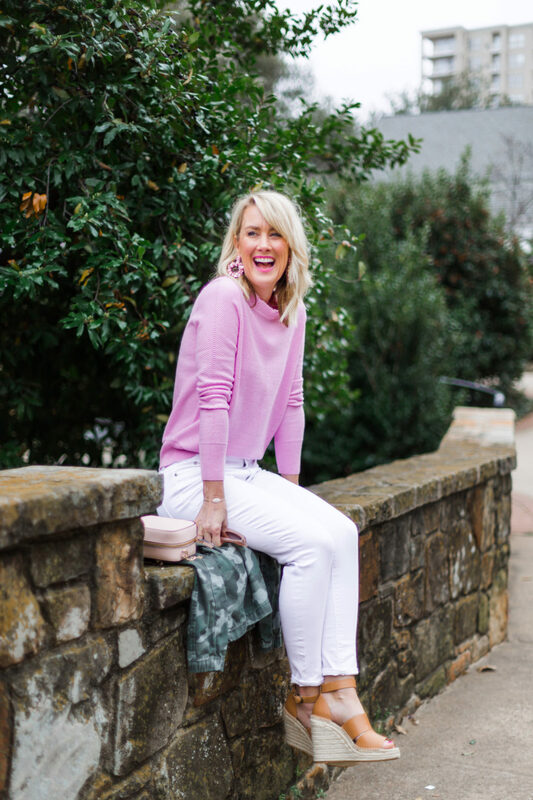 These have been my go-to white jeans for several years…and I’ve yet to find another pair that compares (especially for the price!). 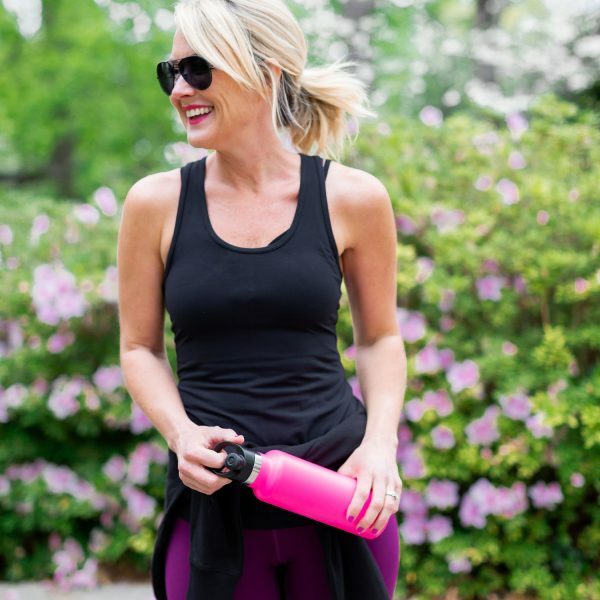 They are thick and opaque so everything stays hidden and tucked in, the pockets don’t show through, and they have a comfy, flattering mid-rise. I had mine hemmed to ankle length, but so excited to see they now come in a new cropped style! Fit Tip: The new ones fit really similar to the previous seasons, and while they feel tight when you first put them on, I still recommend sizing down one!! I promise they’ll stretch and fit great! I’m wearing a size 25 jeans, and XS sweater. 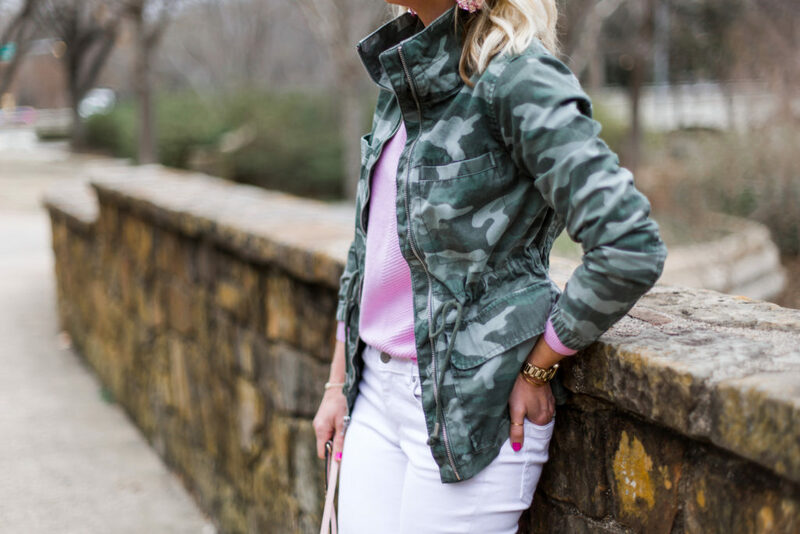 For a second look, I paired the cutest cargo camo pants with my go-to jean jacket and a new white tee. I dressed it up a bit with peep-toe booties, but you could easily swap for these sandals or these sneakers. 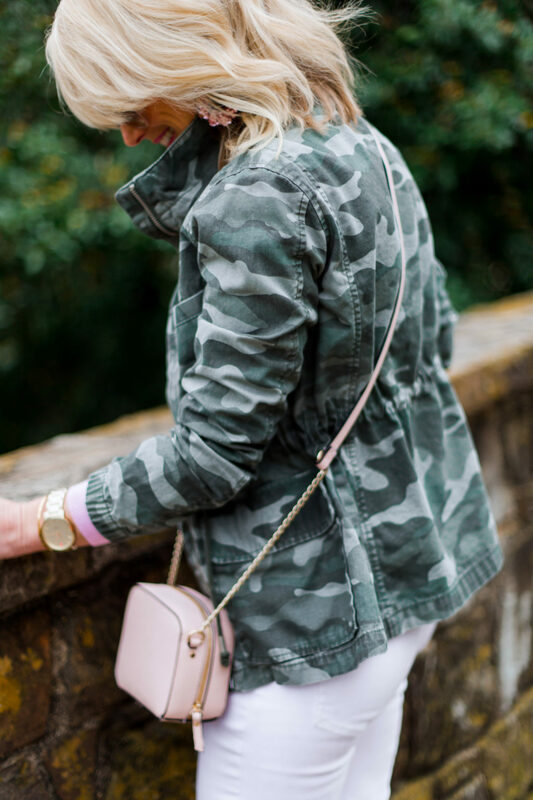 I was instantly drawn to the color and pattern of this camo print, and the soft twill and edgy zipper details won me over. I love the length and pocket placement, too. 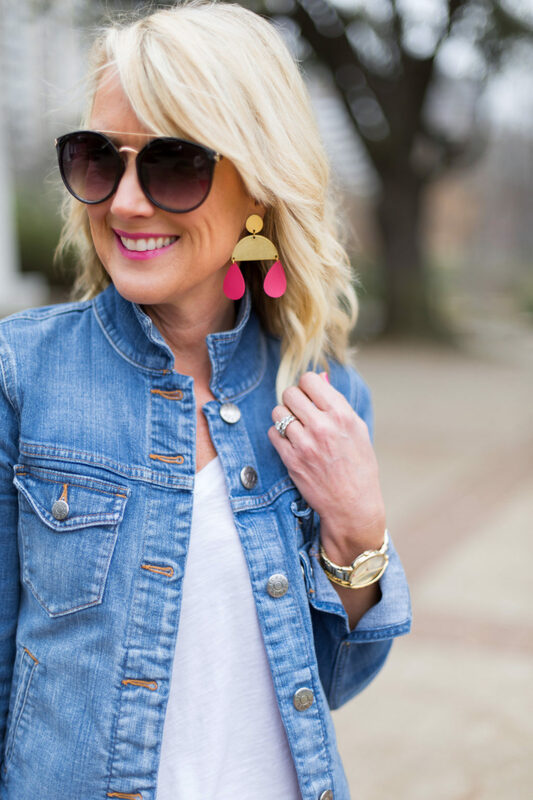 Peep toe booties are a great transition shoe for both Spring and Fall, since they marry seasons and help bridge the gap between that awkward sandal vs boot season. I prefer really neutral tones like taupe and tan for more versatility, and a longer leg-line when worn with dresses. Fit Tip: These are a tad snug, so if you’re in-between, I’d go ahead and size up. The block heel makes them really comfy, too. 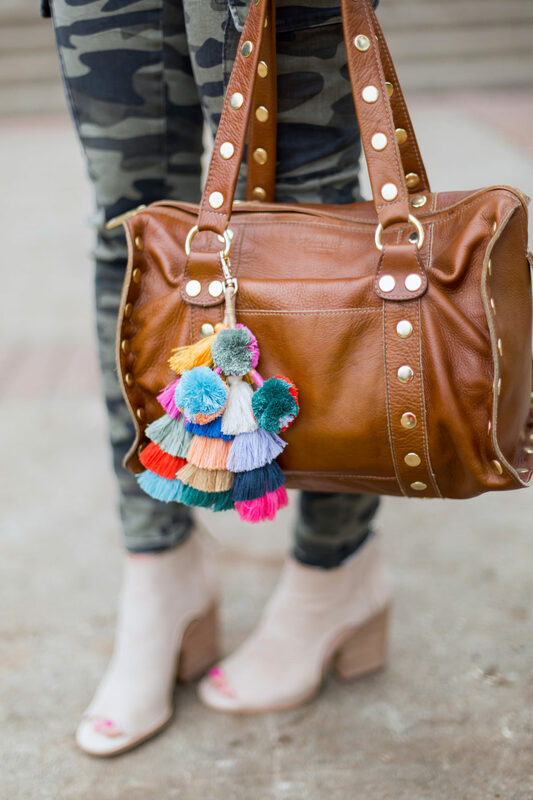 Of course I had to add a splash of color to this neutral combo, and I’m obsessed with this clip-on pom and tassel charm! 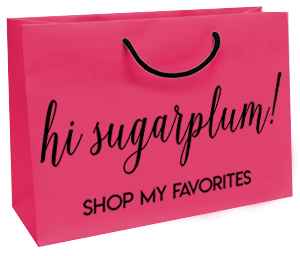 So many great colors, and it looks cute attached to most every bag, tote, and clutch…wait until you see it on this straw pool bag! 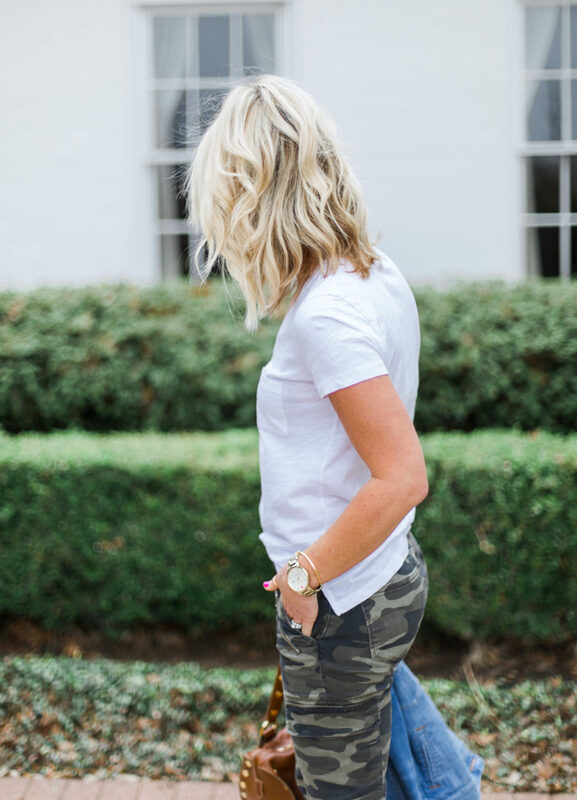 Y’all know I’m a fan of this scoop neck tee, but I’ve had requests to find another option…and finally found one I love just as much! This tee has a slimmer fit through the torso, nice v-neck that’s not too low, and a soft, sturdy cotton that’s not sheer in white! 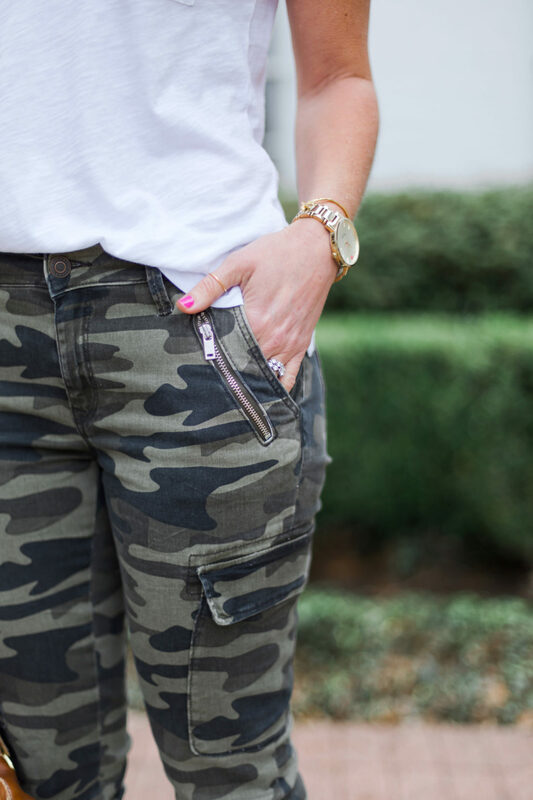 The pocket and a great touch, too. Fit Tip: I thought my usual size was a little snug, so I sized up to a small. Plus, I want to be able to wash and dry it without worrying about a little shrinkage. Whew, that’s a lot of great new staples for Spring! 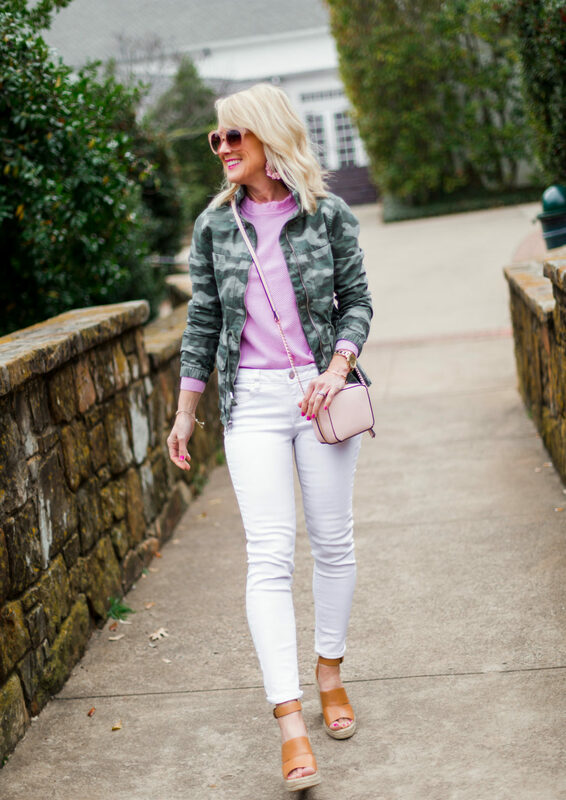 Between the white ankle jeans, white tee, wedges and utility jacket, I think we have the beginnings of the perfect Spring capsule wardrobe! 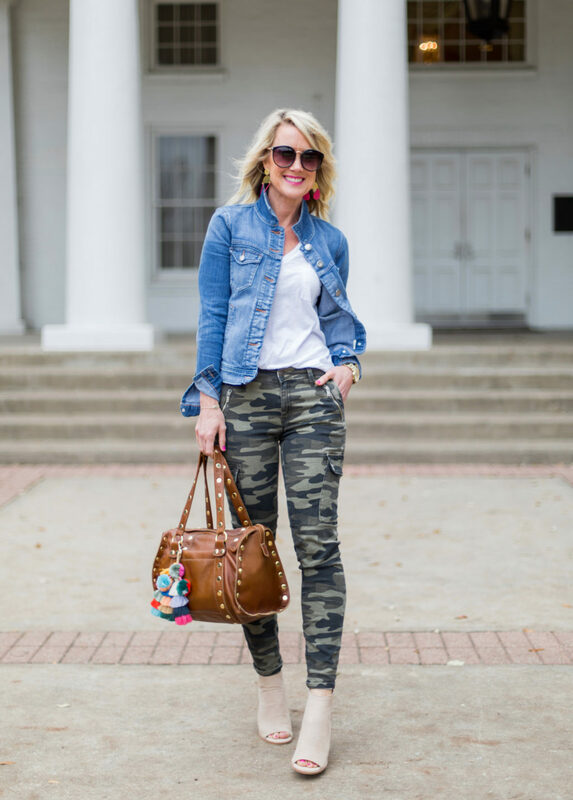 Have I convinced you to add some camo to your closet, or were you already a fan? Happy Monday, lovebugs, I hope it’s a peaceful one! 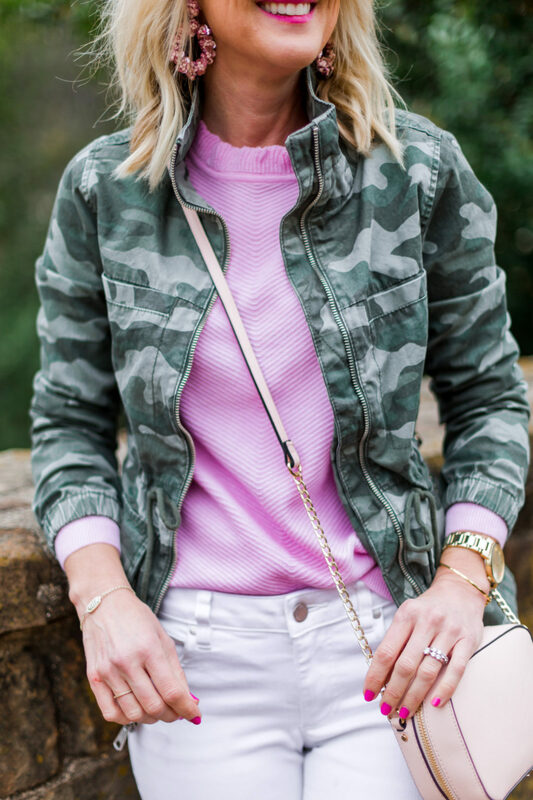 YES to the pink with the camo. 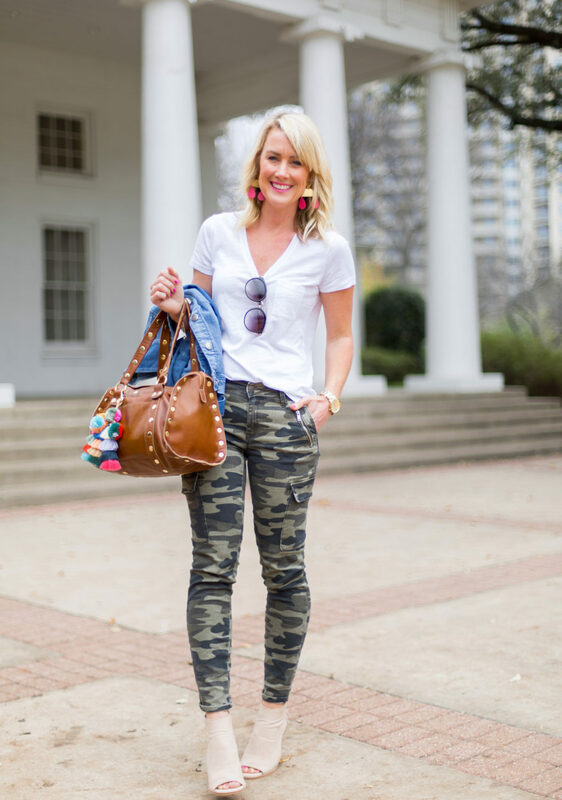 I too am camo obsessed and agree that it is totally a neutral! Love the looks and the pics today! You forgot New Braunfels (TX)! A wee bit too cold for inner tubing tho. 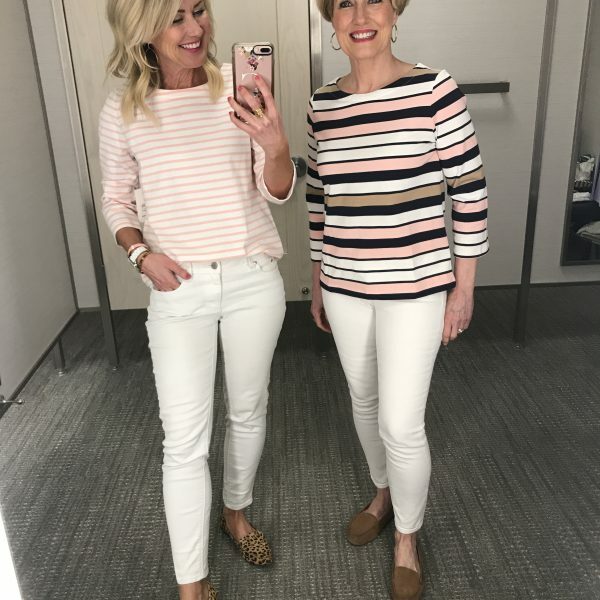 Both great looks! The first look with the jacket may be my favorite. 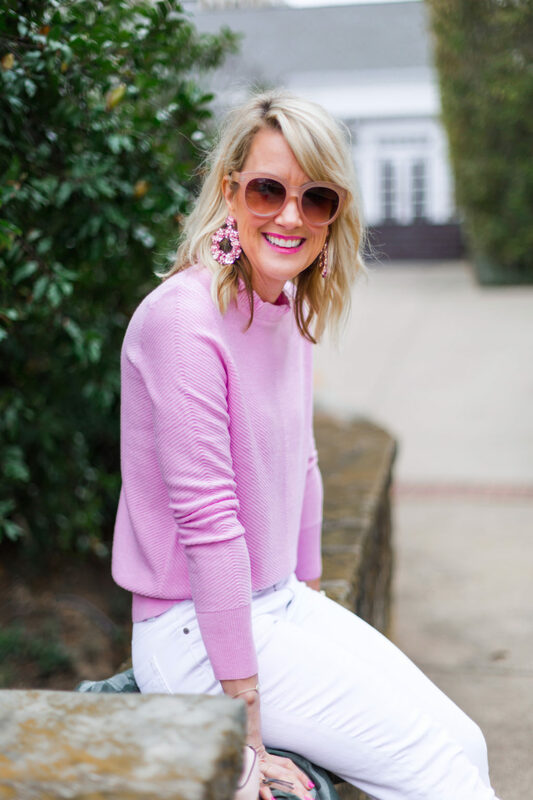 I love that pink sweater and I can’t believe that jacket is such a great deal, +40% off today! You bet I snagged one for myself. 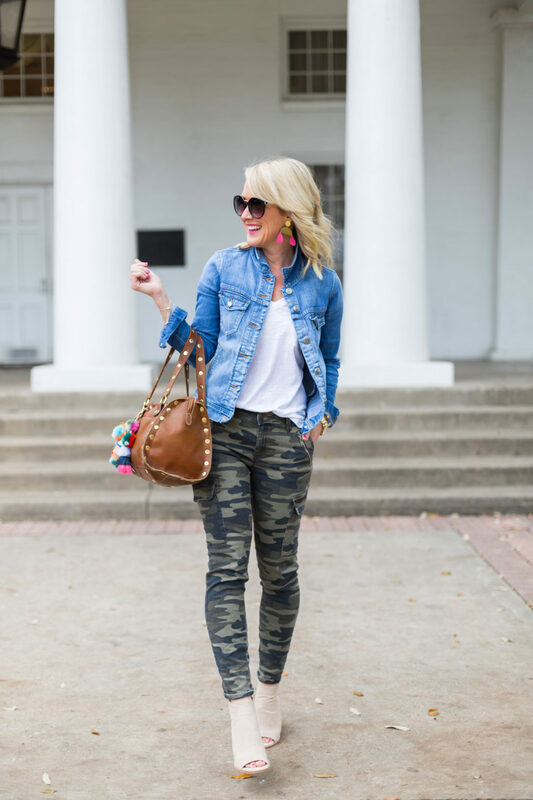 Thanks for the camo inspo!